We've walked here often at New Lanark but never actually up to the waterfalls. We've always just wandered round the old mills and the housing blocks. Small always seemed just too small and the distance a bit too far for her short legs and it wasn't ever the terrain for the pushchair. Well things have changed, Small is not so small anymore and she's started primary school so we ventured back up to New Lanark and to have a look at the linns (Scots for waterfall). A wee bit of background for those that don't know. The Fall of Clyde comprise of 4 linn. 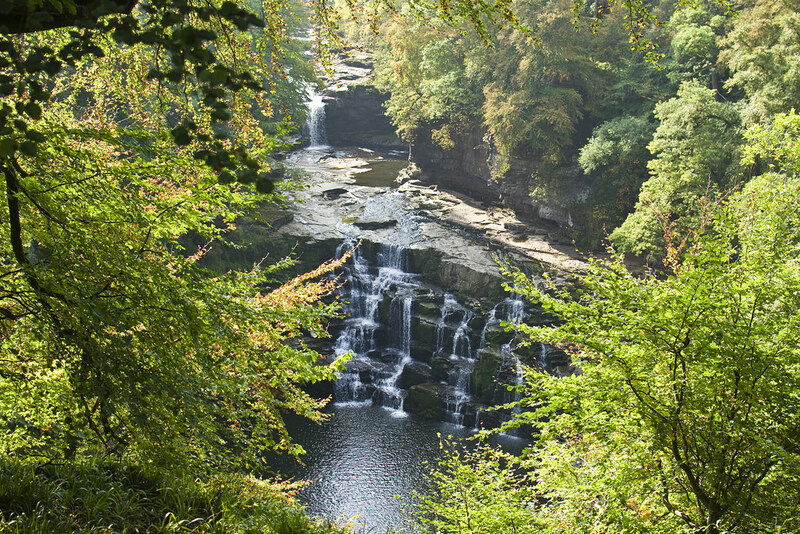 Bonnington Linn which is about 30 feet and is part of a hydro-electric scheme, Corra Linn which is by far the highest at over 80 feet as well as having it's own webcam which is good to have a view after there's been some heavy rains. Dundaff Linn with a fall of about 10 feet. Those 3 all lie above New Lanark. The 4th a final waterfall is Stonebyres Linn which lies a few miles down the water past the village of Kirkfieldbank with in what was once the polices of the old Stonebyres Estate. 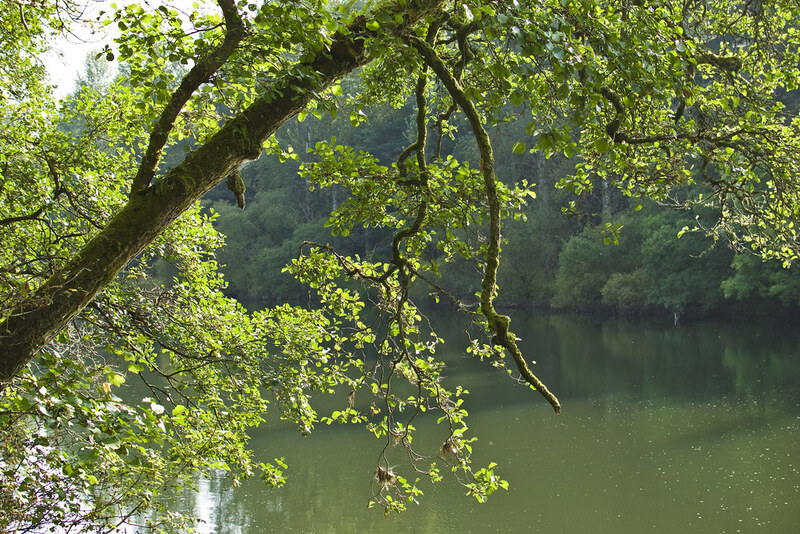 It as now the site of one of the oldest hydro-electric power stations in the UK. The first 3 falls all lie within the Falls of Clyde Reserve managed by the Scottish Wildlife Trust. Late and unseasonably warm autumn sunshine. We pulled in at the car park after lunch at the top of the hill as we always do in some really fine late and unseasonably warm sunshine. A quick change of footwear and we were off down the hill. 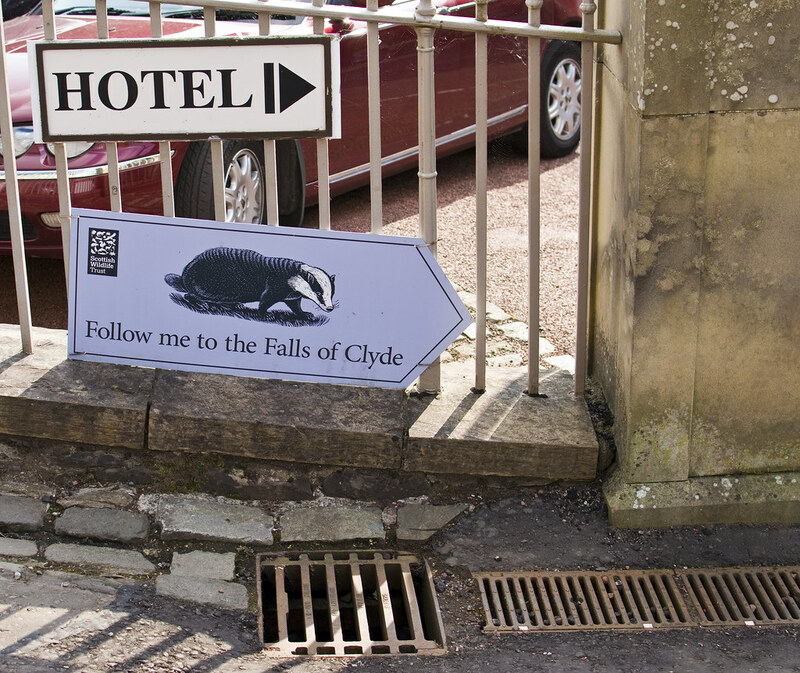 Follow the badger is what the sign said and follow the badger is what we did. Heading off down the steep path to New Lanark. Robert Owen's masterpiece of utopian socialism. It's a great path to walk down towards the hotel, houses and the mills especially in the glorious yellow sunshine. 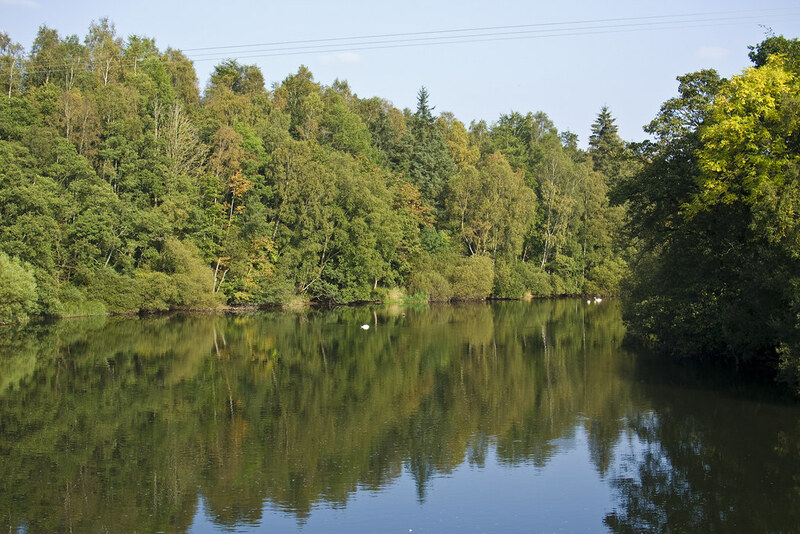 Everything opens up below you and provides you with a great view up and down the river Clyde. Today was a really good day for that view so much so the sunglasses were on. Normally unheard of at this time of year in Scotland. At the bottom of the steep hill next to the small church and the war memorial the hunt for the next badger begun. Which direction was he/she going to point us in. I actually have no idea how you tell from the picture if it is a boy or girl. Small asked and I had just to shrug my shoulders as we looked. Spotting the badger sign quickly we followed on as indicated. Towards the big mill buildings. Badger, badger where are you. Ah, there you are. Not so hard for Small, now that she knew what to look for. This one was over next to a cart selling of all things, ice cream. in the outdoors, in Scotland during autumn or what was meant to be autumn. T-shirts and sunglasses. In previous years on the same weekend I've been hunkered down on hills against the wind or soomin' like a droont rat. Crazy. Again onwards in the direction of the badger. Only this time the signposts had changed. Either that or we had missed the badger! At nearly 5 an just learning reading is not yet a strong point so with a little help we pointed Small the right way. Through the wall and on into the woods. Past the furthest we had gone before on previous visits. Now buggyless things were easier. Where lo and behold we too much excitement another badger picture. Unbeknown to us it would be the last one as again the signposts would change. This last badger was on an information board and part of a set of the dos and don'ts of the trail and also a very informative guide to what you can see as you make your way along the path. We took our time and went through it for Small's benefit so she knew what to look for and lot's of warnings on another board. Steep cliffs, dogs on leashes, children under close control, responsible mountain biking and don't enter into the gorge due to the hydro schemes. Basically be good. The best bit being all the things you can find in the woods; aik, birk, rowan (the tree), loads of other trees, a varied variety of mushrooms which all look great to eat but wouldn't dare and all sorts of woodland creatures and florer and fauna. Now armed with the knowledge of what to look out for Small struck ahead leading the way along the path. 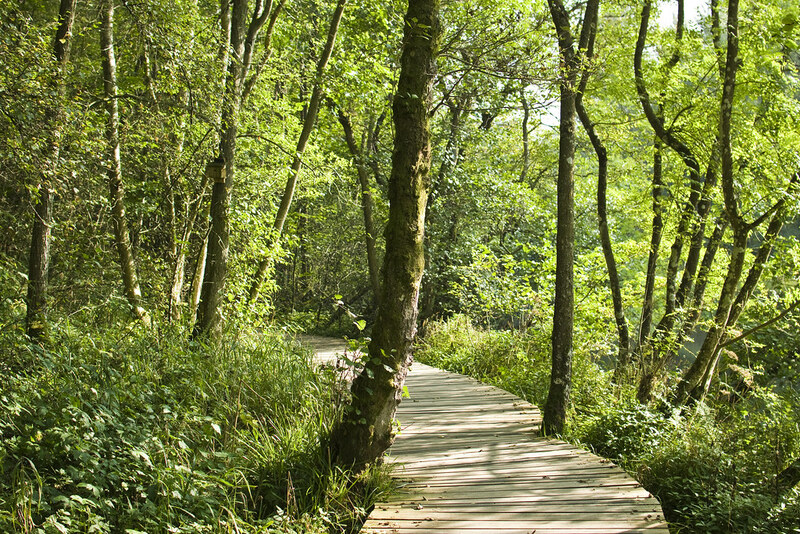 All was well walking along enjoying the sunshine falling through the gaps in the trees dappling the trail. 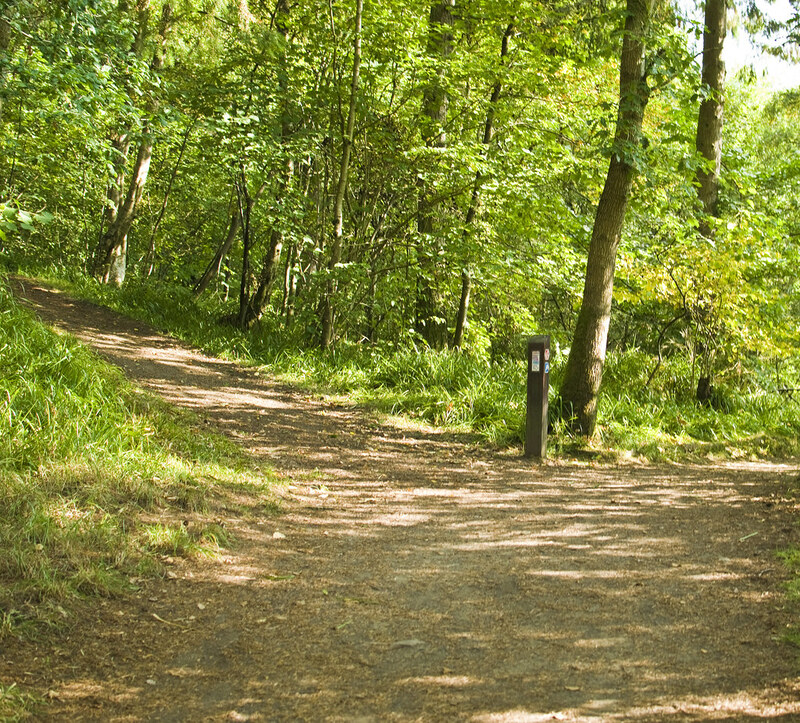 Until we came to a fork in the road. Decision time follow the red marker or the blue marker. No on our 4th or 5th different style of sign. I do think some sort of consistency would be good for signage. I know that the place is managed both by New Lanark world heritage site and the Scottish Wildlife Trust. It would be good if they were on the same page. 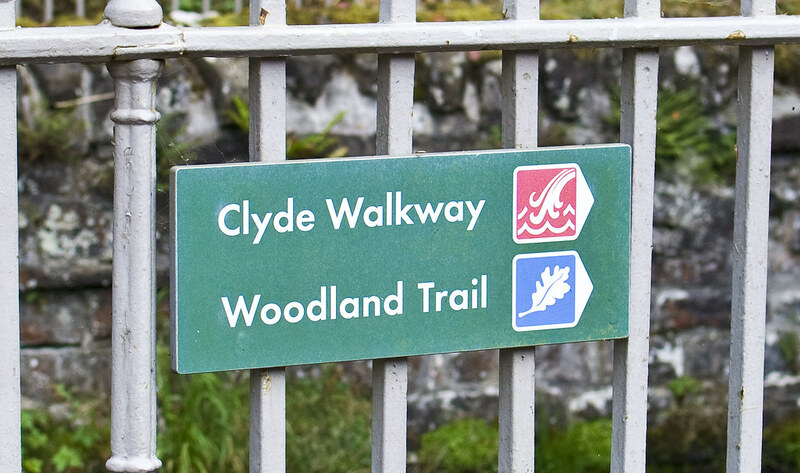 Red was for the riverside walk and blue was the woodland walk or the alternative route should the Clyde be in spate either naturally or because of the hydro plant. Which will still get you to the viewing areas. Already of thinking of another visit after some heavy rains to see the linns especially Corra in full flow. Red it was as we did come to see the waterfalls. Following the right hand fork we dropped down to the water's edge and on to a wooden causeyway. The water on the river here looks deceptively slow here till you see it pouring over the weir. Where it runs at such a tumult. Standing watching the water run and listen to the noise. I noticed in an eddy of slow water next to us a wee broon troot sook a fly or something from the surface and the tiniest of splashes as it kicked its tale as it turned back to the river bottom. There were a couple no more than a few inches long. I pointed them out to Small but she was only seeing the surface of the break. Forgetting I had my sunglasses on which was cutting out the sun's glare on the water. The benefits of polarized lenses. I gave them over to Small so she could see. I'm pretty sure fish weren't mentioned on the information board but I could be wrong. After we had watched the fish a bit we walked on to find yet another different sign post, by this time I had lost count. This one was pointing towards the Bonnington Linn Power station. This is where the path starts to climb up again away from the river and away from the Bonnington Linn Power station. Corra Castle is hard to see in all the trees but still stands proud but ruinous on the high cliffs on the opposite side of the river here. 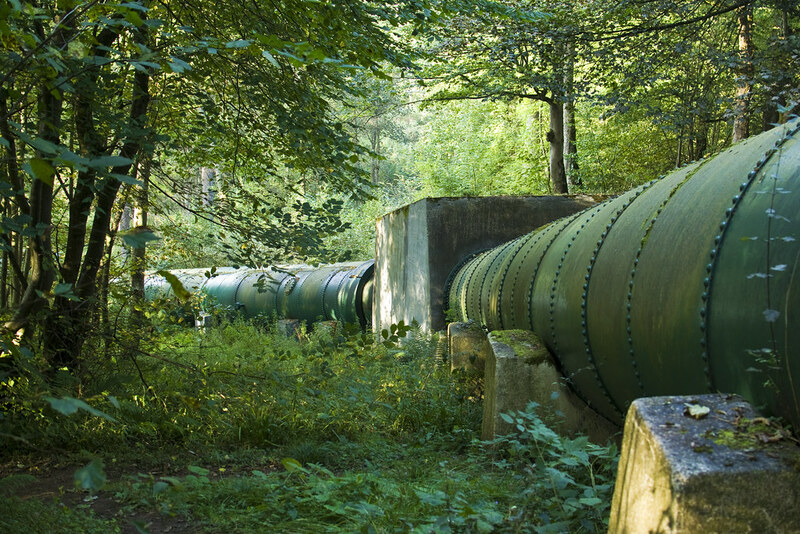 The large pipes painted green and covered in moss merge in to the woods. The path climbs on to the view point of the river's most majestic daughter. Wordsworth he's not but sometimes and probably got this about right. This is probably the best spot on the whole walk if the rivers are running heavy. I'm sure of that. Now it was a case of following the path even higher and onto the Bonnigton waterfall itself. At times here, walking along the path would give you the fear especially with a small person who has no fear, intent on climbing up on railings for a better view. Or poking her head between and leaning out. Not good for the heart. The cliffs must be over 30 metres as the river Clyde here cuts a great gorge here. There high enough that peregrine falcons come to nest in the nooks and crannies. You can come and watch them in spring and summer with their chicks. There's even a hide. We followed on and came to another view point by this time small was getting a bit fed up or hungry both illicit the same responses. Whinging and moaning, her legs were tired, she was hungry. However all was solved when Mummy Bunten produced a packet of Fruitella chews. It was almost like breadcrumbs. If you walk to here you can have another, once we get to this point you can have one more. This is how we got to the big horseshoe of a waterfall and then passed the old iron bridge and onto the new bridge where the water is diverted for the power station. We stood in the middle of the bridge, basking in the glorious late autumn shine. Looking for more fish and watching the swans and ducks floating. Small resting her tired legs. The hill at the end. After that it was a case of retracing our steps all the way a back and finally all that was left to do was climb back up the big hill to the car park. The only badgers we saw where pictures and it was the same with the falcons. Next we might just try for the circular route and see how that goes. Plenty of sweets and juice for bribes to get us round might be the order of the day as well. If you're around this neck of the woods pardon the pun. 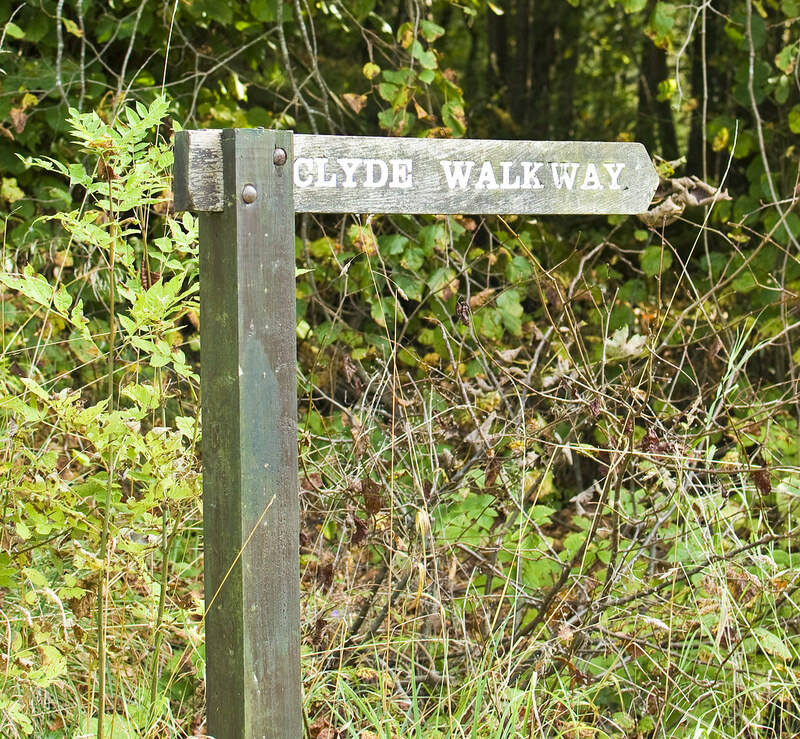 Its well worth a visit to the nature reserve and the Falls of Clyde, anytime of the year. You can see the full set of photographs here New Lanark/Falls of Clyde Flickr set. I'll add more as time goes by and the visits mount up. As always feel free to leave a comment in the box below or send me a message through the contact page. Failing that hit me up on Twitter.